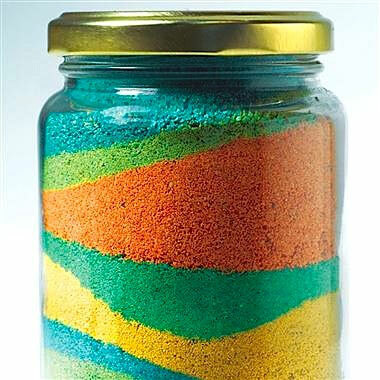 Layer colored sand or salt in a jar to create a beautiful sculpture. Fill cups 2/3 with salt or sand. Add different colors of powdered tempera paint to each cup. Use plastic spoons to mix. You can mix different colors of powder for various additional colors. Pour or spoon colored salt or sand into jars in layers. Use sticks to push against the inside of the jars to create designs. Put a colorful sticker on the top of each jar or glue some colorful feathers to the top. Tie colorful yarn around the outside edge of the lid. 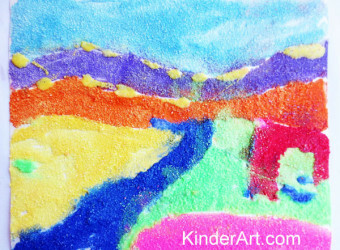 Note: As an alternative to powdered tempera (which some folks have concerns about using), you can use food coloring to color the sand or salt. In that case, you will need a jar and lid (or a zip bag) for every color. Add sand to a jar, drop some food coloring in, close the lid tightly and shake until the food coloring makes all of the sand colored. Let the sand dry overnight and then use it as above.